Hello there! We’ve been having quite the heat wave lately, and my kids LOVE popsicles. However, I don’t love that most popsicles are full of added sugar, and artificial color and flavors. 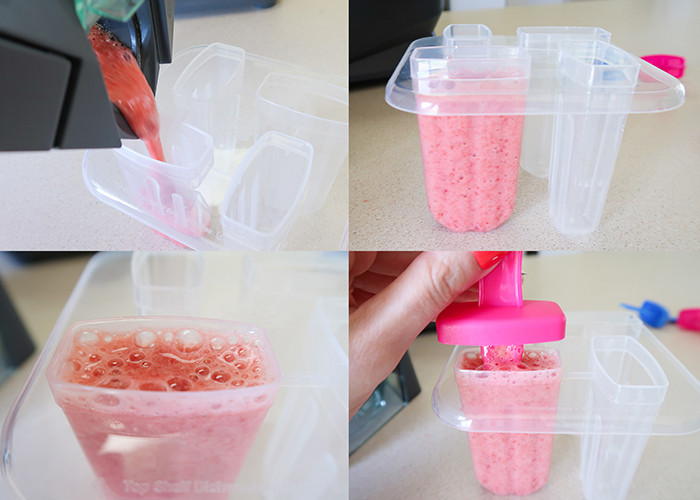 So today I’m sharing how to make these Fruit Smoothie Popsicles! 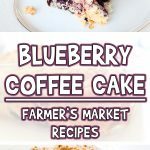 You can use any combination of fruit that you’d like, and since the only ingredients are fruit and water these are very allergy friendly as well. Here’s what you’ll need! Blender. You don’t need a big one like a have, even a small bullet style blender works great. Popsicle molds. Or you can use paper cups and popsicle sticks, but I like molds because they’re reusable and the handles are designed to catch drips so they don’t stain clothes. Fruit of your choice. I’m using bananas and strawberries, but you can use blueberries, mango, kiwi, peaches, raspberries, pretty much any fruit you like. 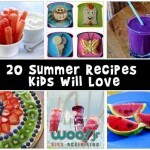 And if you don’t have access to fresh fruit, frozen works perfectly too! I often have frozen bananas in the freezer, so I tend to pull those out for recipes like this. I used 1 1/2 frozen bananas and threw them in the blender. Then I cut the tops off of about 10 strawberries and added those in as well. I then added in 1/2 cup of water. You can use juice if you’d like as well. Then blend until you’re happy with the consistency. You can leave it chunky or make it smooth. You can also blend it smooth and then add in more diced up fruits for a pretty effect. Now just pour it into your molds up to the fill line. And when they’re all filled, pop them in the freezer. Depending on your freezer and the size of your molds, they can take anywhere from 2-4 hours to freeze. 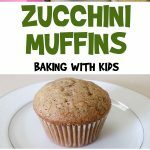 I like to make mine at night and put them in the freezer overnight, so my kids can have them after the come back inside from playing in the morning. Aren’t they pretty? 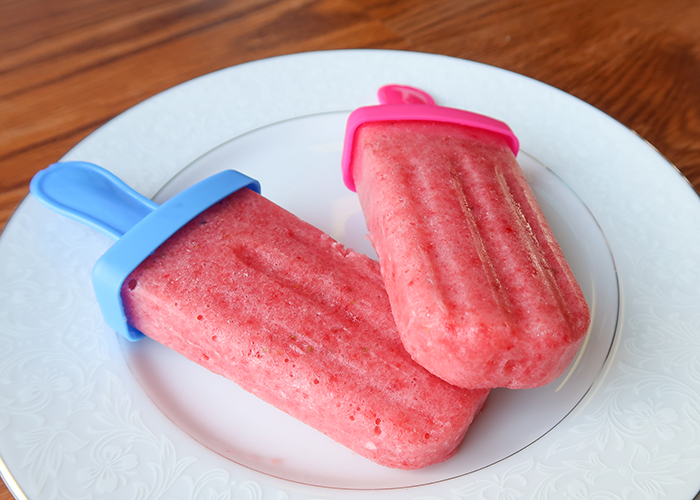 My kids love these fruit smoothie popsicles, and it’s a great way to get all those amazing fruit micro nutrients into your kids while they’re having a cool treat! Hello there! We've been having quite the heat wave lately, and my kids LOVE popsicles. However, I don't love that most popsicles are full of added sugar, and artificial color and flavors. 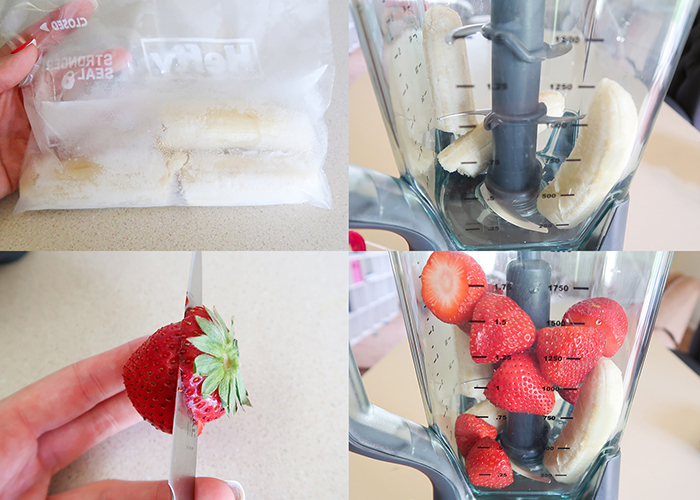 So today I'm sharing how to make these Fruit Smoothie Popsicles! 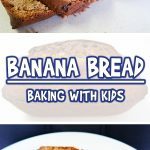 You can use any combination of fruit that you'd like, and since the only ingredients are fruit and water these are very allergy friendly as well. 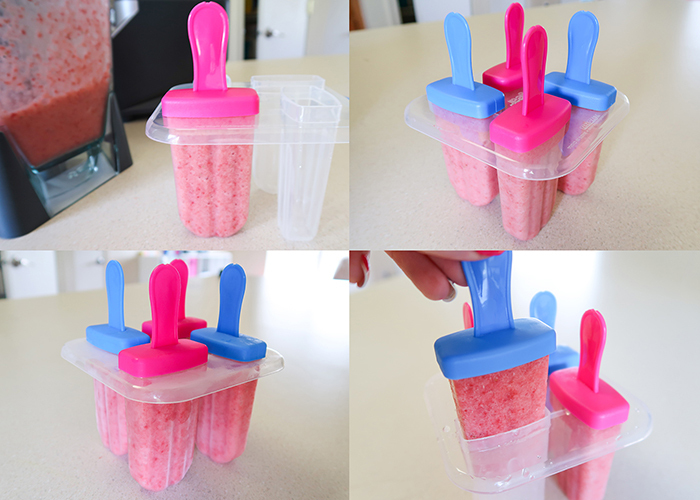 Popsicle molds. Or you can use paper cups and popsicle sticks but I like molds because they're reusable and the handles are designed to catch drips so they don't stain clothes. Fruit of your choice. I'm using bananas and strawberries but you can use blueberries, mango, kiwi, peaches, raspberries, pretty much any fruit you like. And if you don't have access to fresh fruit, frozen works perfectly too! I often have frozen bananas in the freezer, so I tend to pull those out for recipes like this. 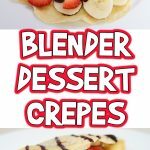 I used 1 1/2 frozen bananas and threw them in the blender. Then I cut the tops off of about 10 strawberries and added those in as well. 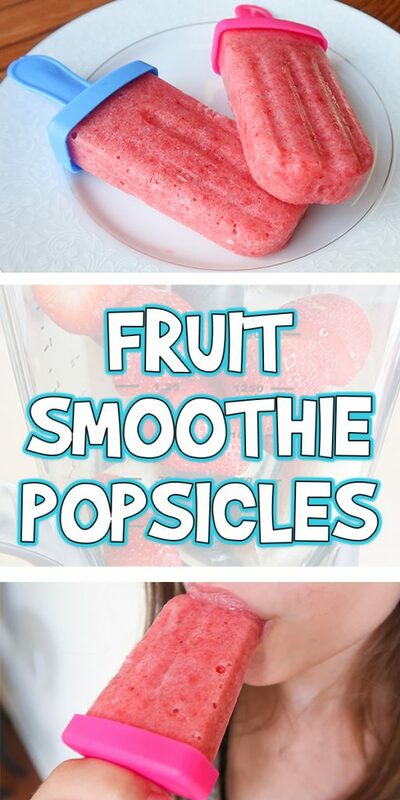 You can use any fruit you'd like. Add in 1/2 cup of water. You can use juice if you'd like as well. Then blend until you're happy with the consistency. You can leave it chunky or make it smooth. 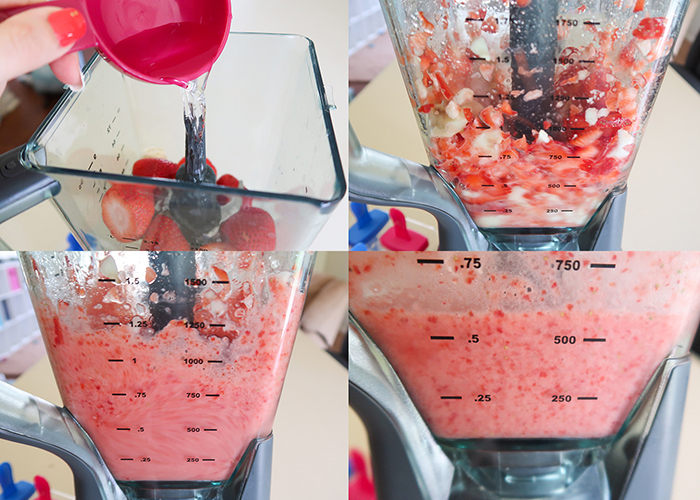 You can also blend it smooth and then add in more diced up fruits for a pretty effect. If it's too thick, add in more water. Now just pour it into your molds up to the fill line. And when they're all filled, pop them in the freezer. Depending on your freezer and the size of your molds, they can take anywhere from 2-4 hours to freeze. 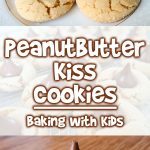 I like to make mine at night and put them in the freezer overnight, so my kids can have them after the come back inside from playing in the morning. Aren't they pretty? 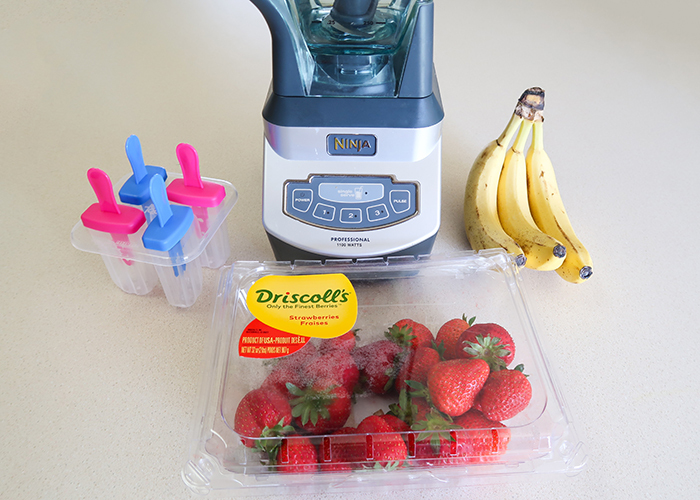 My kids love these fruit smoothie popsicles, and it's a great way to get all those amazing fruit micro nutrients into your kids while they're having a cool treat!